A timeless, classic design - masterfully updated. We are now proud to offer the first ever METALLIC deck of BicycleÂ® playing cards. Your favourite cards, fully optimized and transformed into something you have never seen before. 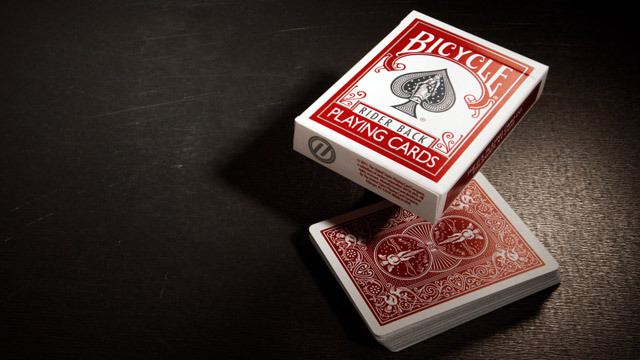 BicycleÂ® playing cards have been the industry standard for over a century. Originally unveiled in the late 19th century, their reputation for quality and universal appeal is without equal. They have been and will continue to be the premier choice for card enthusiasts around the world. Available in two colours - Steel Blue and Crimson Red - the Bicycle Titanium Edition playing cards were printed at the United States Playing Card Company using the finest quality stock and finish. They feel smooth - not too rigid - right out of the box. Bicycle Titanium Edition Red A timeless, classic design - masterfully updated. We are now proud to offer the first ever METALLIC deck of BicycleÂ® playing cards.